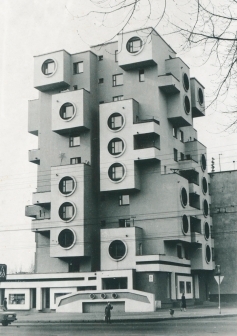 Far from all the clichés of monotonous looking Soviet architecture, the exhibition and the catalogue draw attention to regional architectural specialities completed in the period between the ‘Khrushchev Thaw’ and ‘Perestroika’, showing impressive architecture that challenges the writing of the history of postwar Modernism dominated by the West. same standards in a closed political system. Exhibition curators: Katharina Ritter, Ekaterina Shapiro-Obermair, Alexandra Wachter The exhibition project is based on an initiative by Georg Schöllhammer and the association ‘Local Modernities’.